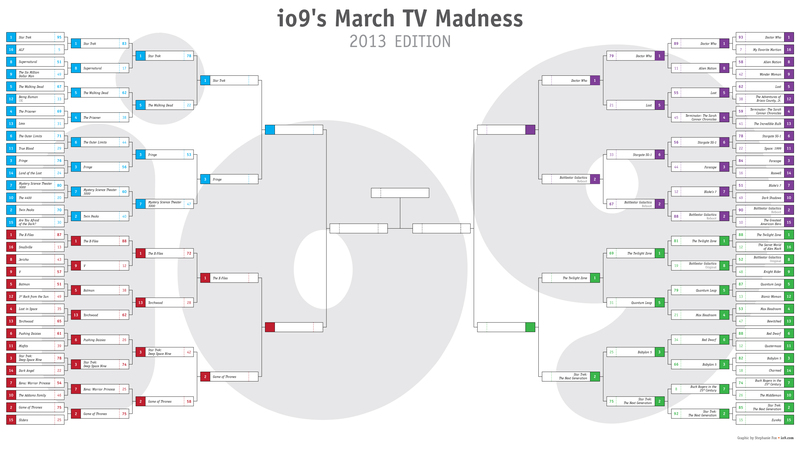 io9's March TV Madness: Vote Now for the Final Four Science Fiction and Fantasy TV Classics! We've now reached the Elite Eight in our quest to find the great sci-fi and fantasy TV shows of all time. We've got some fierce match-ups for you to vote on today: Star Trek vs. Fringe! The X-Files vs. Game of Thrones! 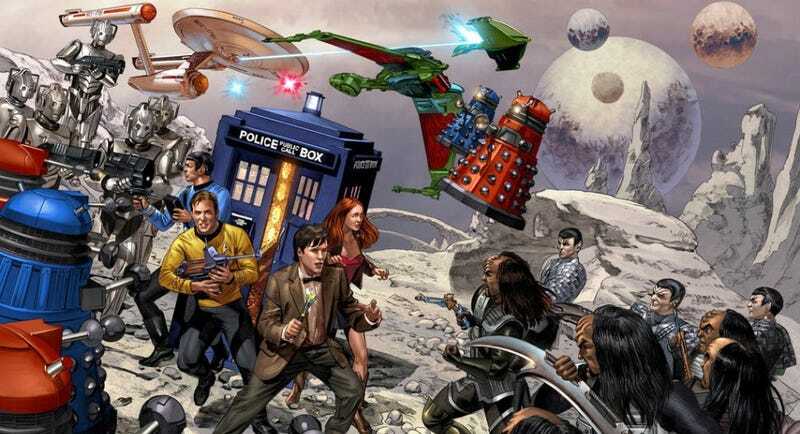 Doctor Who vs. the BSG reboot! The Twilight Zone vs. Star Trek: The Next Generation! The polls are open, so vote now! You can find all the polls down below, and the voting will be open until midnight Pacific time tonight. We're looking to determine the Final Four today, as these eight shows duke it out to win their respective regionals. Come back on Monday, March 25 for the first of two Final Four match-ups, plus the first round of the Whedon Invitational Tournament. If you've been desperate all tournament to cast a vote for Firefly, then Monday is your big chance! We'll have our special W.I.T. bracket on Monday, but first let's take a look at our updated big bracket. You can click on it below to expand or go here for an even closer look. So far, the tournament has been kind to the favorites — all four of the 1-seeds are still alive, and the only 2-seed not to make it (Twin Peaks, which got caught in the wheels of progress the MST3K buzzsaw) has been replaced by the 3-seed Fringe. Indeed, Fringe had to rally from an early deficit to pull away from Mystery Science Theater 3000, ending the show's underdog run with a final 53%-47% victory. None of the other matches were so close, although Star Trek: Deep Space Nine put in a credible effort against Game of Thrones, falling 58-42. But all that is just the buildup to today's matches. On the left side of the bracket, we see a pair of venerable classics taking on some modern juggernauts, as Star Trek clashes with Fringe and The X-Files takes on Game of Thrones. On the right side of the bracket, two of the grandfathers of all TV science fiction, The Twilight Zone and Doctor Who, send their infinitely adaptable formats into battle with two of the most successful space operas ever made, Star Trek: The Next Generation and the Battlestar Galactica reboot. Who will emerge victorious? That's for you to decide! Vote now and decide which four of these shows stay alive in their quest for bracket immortality. Polls close at midnight Pacific time tonight! Top image by Summerset on DeviantArt.